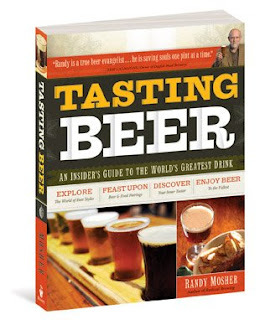 A few months ago, I had the pleasure of sitting down to lunch with Randy Mosher, the author of Tasting Beer. Randy was going to be interviewed on Northeast Public Radio that afternoon at a favorite watering hole here in the Berkshires: The Old Forge. While we were waiting for the producer, Joe Donahue, to arrive, Randy and I looked over the beer list, which went on for pages, giving us hundreds to choose from in bottle and on tap. I was overwhelmed by the choices, so Randy honed in on my preferences, helping me decide which would be the best beer for me that afternoon. After I explained that I appreciated both wheat beers and stouts, he knew exactly what would make my palate jump for joy: Aventinus by Shneider Weisse, a wheat doppelbock with hints of spicy chocolate and caramel. Sold. 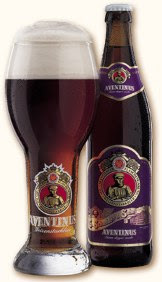 When the waitress placed it in front of me, she gave me the bottle with an empty glass, so I immediately picked up the bottle, tilted it to a 45-degree angle, and started pouring the Aventinus down the side of the glass to avoid a lot of foam on top. One quick look from Randy told me I was in for some tutoring. I felt like I had just committed a cardinal sin in front of the Pope. Sheepishly, I put the beer down and listened to his sage advice: Pour the beer directly into the center of the glass to build a strong head, so the complex flavors of the beer can breathe. I did what he said, and the beer overflowed all over the table. Oops. As I turned bright red from embarrassment, I quickly tried to clean up my mess. Randy just chuckled and told me to practice; over time, he said, I’ll be able to gauge the foam and the beer and the glass and somehow find the perfect pour in all of it. Apparently (read: THANKFULLY), I’m not the only one out there who needs to practice pouring beer this summer. The Chicago Tribune did an article last month mentioning the book, Randy, and the art of pouring a good beer. Maybe all of us beer-pouring practitioners should get together to perfect our skills? There’s a lot to be said for power in numbers.